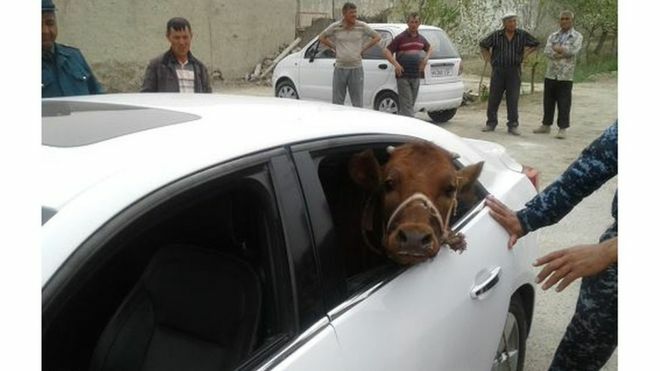 Police in Uzbekistan have apprehended two men for stealing livestock after catching them red-handed with a calf in the back of an expensive car. 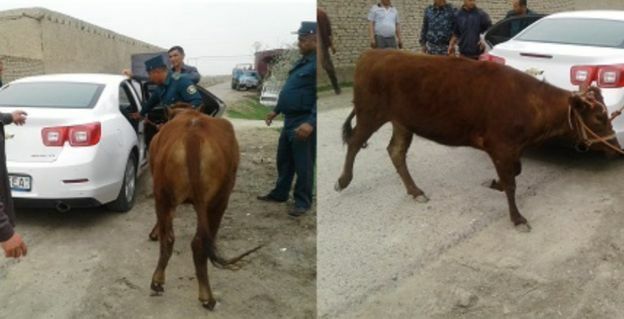 Officers in Uzbekistan’s Bukhara region were investigating a report from villagers who had lost a cow and a sheep, and managed to track down two suspects, the UzNews website says. In order to avoid suspicion, they had been transporting stolen sheep and cattle – even bulls – in a Malibu Chevrolet owned by one of the men, regional police said. The American brand is a popular one in Uzbekistan where parent company General Motors have a factory – so much so that in 2013, the chance to put a down payment on a car sparked a small stampede. It is easier to buy a Chevrolet these days, but a Malibu is still a luxury ride. It is the most expensive of locally produced cars made by the country’s monopolist GM Uzbekistan and costs about about 30,000 dollars – a hundred times the average monthly wage there. The story has tickled Uzbeks reading about it on social media. “A least the cow looks happy,” one Facebook user says. “Of course, it was stolen in a Malibu car, like a bride,” jokes another. A New Zealand lobby group for senior citizens has criticised a company for selling special plates for cars telling road users that the driver is elderly. The so-called “E-plates” are being sold by Auckland-based company SafeGrannies as a weapon against road rage, the Stuff.co.nz news website reports. “A large percentage of road rage could be removed if [drivers] were aware who was in front of them,” says company founder Nick Carrol, pointing out that the signs have similar intentions to ‘baby on board’ signs used by parents in encouraging other drivers to slow down. But the Grey Power lobby group for over-50s says the NZ$12 (US$9; £6) signs are “ageist”. Its president Tom O’Connor says that he suspects they will do nothing for “the conduct of idiots on the roads”. “I’ve got no objection if someone wants to put one on their car, but I don’t believe it would help in terms of safety,” he says. Mr Carrol, however, says that his plates have received widespread support from the local elderly community, and claims that senior citizens are safer drivers than young men. “Older drivers are actually the ones sticking to the speed limit, and in Auckland, that’s not fast enough for other drivers,” he told Stuff. His claim is backed up by Insurance Brokers Association of New Zealand (IBANZ), which said in 2016 that 18-25 year-old men are the highest risk group of drivers. IBANZ chief executive Gary Young said at the time that “young males under 25 are diabolical drivers and tend to have the most accidents.